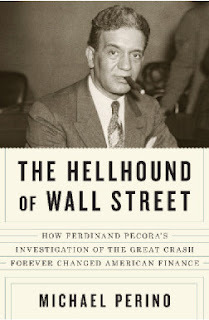 Author Michael Perino will serve as a special guest to The Justinian Society of Philadelphia on October 24, 2011 from 11:30 a.m. to 1:00 p.m. at The Union League of Philadelphia. He will present his latest book, The Hellhound of Wall Street: How Ferdinand Pecora’s Investigation of the Great Crash Forever Changed American Finance. Michael Perino is currently the Dean George W. Matheson Professor of Law at St. John’s University School of Law in New York. A former Wall Street litigator, Perino has testified in the United States Senate and the House of Representatives and has consulted with the Securities and Exchange Commission. He is frequently quoted in the media on securities and corporate matters. He has appeared on NPR's All Things Considered, Morning Edition, and Marketplace, on Bill Moyers Journal on PBS, and on CNBC. Perino has presented his book at the National Archives in Washington, Stanford Law School, George Washington Law School, the New York Court of Appeals, the John D. Calandra Italian American Institute and the New York Athletic Club to name a few. Perino received his LL.M. degree from Columbia Law School, where he was valedictorian, a James Kent Scholar, and the recipient of the Walter Gellhorn Prize for outstanding proficiency in legal studies. He received his J.D. from Boston College Law School, where he was elected to the Order of the Coif. Tickets for this program are $65 per person for members and $80 for non-members. Checks are payable to The Justinian Society of Philadelphia and should be mailed to 1205 Locust Street, Suite 100, Philadelphia, Pa 19107. For more information, call 215.545.0706 or e-mail jct.uta@att.net.